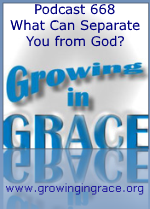 Growing in Grace Podcast: 668. What Can Separate You from God? As a believer in Jesus Christ, it’s possible you’ve heard a list of things that can separate you from God. At the very least, you’ve been told that fellowship with God can be broken, hindered or put on hold based upon certain behavior malfunctions on your part. In some corners of Christianity, it becomes a rather long list of things you should work at avoiding, along with another list you should put effort into doing. 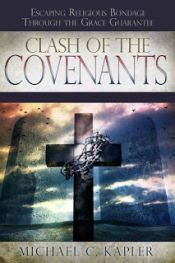 If you have “fallen out of fellowship” with God, religion might have you reaching for a rededication prayer while seeking a renewed forgiveness from God, as if Jesus had just returned to perform another sacrifice.